Any Dirty Party is a rock duo based in Rome, formed in the summer of 2013 by two guys who met at a party where they discovered they shared the same lady. The band consists of Renato Votto (vocals and guitar) and Alessio Ragusa (drums). Singer and guitarist Renato was introduced to music at an early age by his grandfather, a carpenter and church pipe organ player. Renato used to stare at his grandfather's black oxford shoes pushing on the organ pedalboard, so the old man built and gave him a bass guitar. Renato still treasures that gift and he is also having the mania to wear only black shoes. Drummer Alessio received a guitar from his father but he realized that it wasn't his passion when he found himself using pencils as drum sticks on the school desk whilst the music teacher talked about Scott Joplin ragtime. His mother, in order to calm down her son, decided to buy him some great big drums. The boy was so curious about the instrument that, when older, he moved between the US and Latin America to learn about the spare blues drumming and caribbean rhythms. Before joining Any Dirty Party, both members played in several bands influenced by rock and roll, blues and punk music. 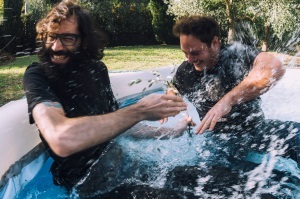 Since their live debut in spring 2014, Any Dirty Party played several shows all over Italy, including festivals, such as Cusano Talk Festival. In October 2014 they were selected amongst more than 600 bands from Italy and Europe by Rock Contest (Controradio, Florence) and they played at the first edition of "Primo Maggio Della Valle del Tevere", where they shared the stage with Italian and European artists such as Riccardo Sinigallia and Nina. In April 2014 they recorded a 5 tracks EP with Matt Bordin (The Mojomatics). It will be released on off label records (Germany) in autumn 2015, on 12" (white vinyl) and CD. Every party starts with a dirty lie. A lie between pink and blue. and another that goes there alone. Or so he thinks. In fact, between the pink and the blue, neither man is alone. it's a damned dirty party.